Wow, I’ve been crazy busy crafting but haven’t been posting any of my projects here. Time to start making up for that! 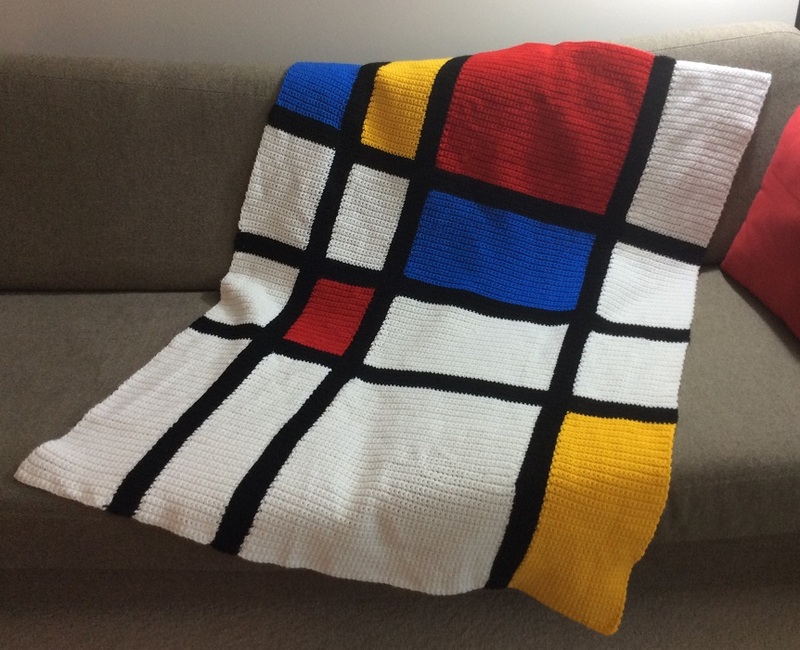 The first one is the Mondrian inspired baby blanket from Stacey Trock’s Modern Baby Crochet. I was immediately taken with this blanket when I saw it, and intrigued by the way it was created, so I had to give it a go. It’s single crocheted in seven long vertical strips which are then mattress stitched together. I’ll be honest: The mattress stitching was a pain in the *b*. I actually might have preferred to mitigate the colour changes as I went than to have that much finishing to do at the end. But, it made for a really nice way to stitch an afghan during the heat of the summer without having a huge pile of blanket in my lap. I didn’t have a plan for this afghan when I started it, but the son of a good family friend just had a baby, so my “Aunt” (who may in fact be the proudest new grandma in the world) was also quite taken with this blanket and thought it would be a great one to have on hand for when new baby Audrey comes to visit. And since it’s made from easy care acrylic it should be able to withstand all the wear and tear and washing a baby blanket will require.